I hope to answer his question. Kloner’s reasoning may be summarized as follows: (1) the burial caves of the Dominican Monastery are Iron Age II tombs (eighth—sixth centuries B.C.) because they present several similarities with Iron Age II tombs in the region, whose dating is assured by the pottery; (2) the difference between these tombs and the burial caves of the Dominican Monastery can be explained if we assume that they were special tombs, probably the tombs of nobles or even of kings; (3) in the Iron Age II period, Jerusalem expanded, probably also to the north (Kloner quotes Jeremiah 31:38), and, according to the Bible, the Judahite kings from Manasseh onward were buried outside the City of David, in the “Garden of Uzza” (cf. 2 Kings 21:18); (4) in the description of the Third Wall given by Flavius Josephus in The Jewish War, the “burial caves of the kings” are mentioned; (5) according to the topography, the burial caves of the kings cited by Josephus could be the ones in the Dominican Monastery. So have the tombs of the kings of Judah been found? After more than 20 years, Shanks deserves a direct, clear answer to his question! In place of the words “royal caverns” in this text Kloner has “burial caves of the kings,” translating the Greek word spelaion as “burial cave,” following what he understands to be a possible translation given by the dictionary of Liddell and Scott.10 In fact, this dictionary translates spelaion as “grotto” or “ cavern” and adds “grave” for only three examples: two inscriptions from the first and second centuries A.D. of tombs in Palmyra, and the Gospel of John 11:38. In the last example, following the interpretation of Brown11 and Moloney,12 spelaion has to be translated as “cave,” as in the NET: “Jesus, intensely moved again, came to the tomb. (Now it was a cave, and a stone was placed across it. )” (John 11:38). Another issue of the Josephus text is raised when we consider that in the same passage of The Jewish War he refers to two other sepulchres, those of Queen Helena and of the Fuller. It seems very strange that for such important monuments as the kings’ tombs Josephus should use such an unusual word. 1. Hershel Shanks, “Have the Tombs of the Kings of Judah Been Found?” BAR, July/August 1987, pp. 54— 56. 2. Amos Kloner, “The ‘Third Wall’ in Jerusalem and the ‘Cave of the Kings’ (Josephus, The Jewish War5.147),” Levant 18 (1986), pp. 121—129. 3. Cf. Louis-Hughes Vincent, “Encore la troisième enceinte de Jérusalem,” Revue Biblique 54 (1947), p. 117. 4. Cf. Michael Avi-Yonah, “The Third and Second Walls of Jerusalem”, Israel Exploration Journal, 18 (1968), p. 121. 5. Cf. Pierre Benoit, “Où en est la question du ‘troisième mur’?” in Michele Piccirillo, Ignazio Mancini, Emmanuele Testa, Bellarmino Bagatti and Giovanni Claudio Bottini, eds. Studia Hierosolymitana,Vol. 1. (Jerusalem: Franciscan Print Press, 1976), p. 114. 6. Cf. Gregory J. Wightman, The Walls of Jerusalem: From the Canaanites to the Mamluk. (London: Meditarch, 1993), pp. 161—162. 7. Cf. Max Küchler, Jerusalem: ein Handbuch und Studienreiseführer zur Heiligen Stadt (Göttingen: Vandenhoeck & Ruprecht, 2007), p. 981. 8. 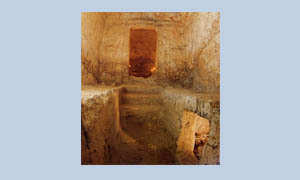 Amos Kloner and Boaz Zissu, The Necropolis of Jerusalem in the Second Temple Period (Leuven-Dudley, MA: Peeters, 2007), p. 467. 9. Josephus, The Jewish War 5.147 (Thackeray, LCL). 10. H G. Liddell, R. Scott and H. S. Jones. A Greek-English Lexicon. 9th ed., revised supplement (Oxford, 1996), article σπηλαιον. 11. Cf. Raymond Brown, The Gospel According to John. Anchor Bible 29, vol. 1 (Garden City, New York: Doubleday, 1966), p. 426. 12. Cf. Francis J. Moloney, The Gospel of John: Text and Context (Leiden: Brill, 2005), p. 341. 14. Cf. LSJ articles : μνημειον and ταφηιον. 15. Karl Heinrich Rengstorf, A Complete Concordance to Flavius Josephus (Leiden: Brill, 2002), article σπηλαιον. 16. Ibidem: articles ταφος; μνημειον; μνημα; θηκη. 17. Josephus, Antiquities 8. 264.285; 9. 104.166.172.243; 10. 77; 14. 124; 15. 61; 16. 181. 18. Cf. Küchler, Jerusalem, pp.978— 965. 19. Cf. H.Leeming, K. Leeming, eds. Josephus’ Jewish War and its Slavonic Version. (Leiden-Boston: Brill, 2003), p. 480. Jerusalem, pp.161—162; Cf. Jérôme Murphy O’Connor, The Holy Land: An Oxford Archaeological Guide (Oxford: Oxford University Press, 2008), p. 162. 22. Cf. Nadav Na’aman, “Death Formulae and the Burial Place of the Kings of the House of David.”,Bibica 85 (2004), pp. 249—253. 23. Shanks, “Have the Tombs of the Kings of Judah Been Found?”, p. 56. 24. Cf. notes 21 and 22. Fr. Riccardo Lufrani is professor of topography of Jerusalem and Southern Levant at the École Biblique et Archéologique Française in Jerusalem.